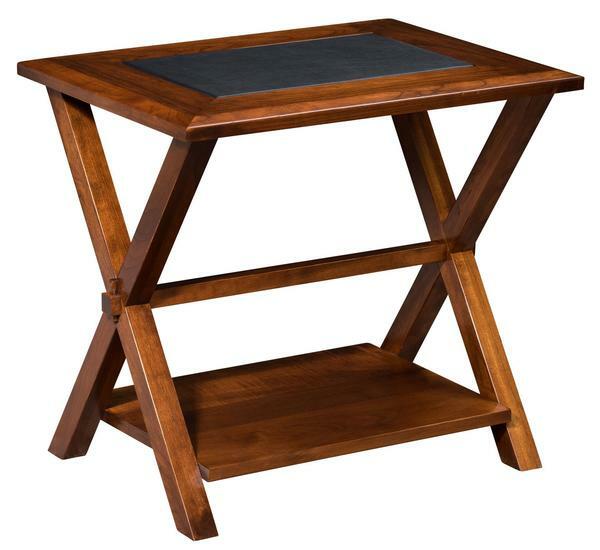 Our Amish Lexington End Table with Bottom Shelf is well-suited for a variety of spaces. Its modern farmhouse style design includes a wood frame top with a glass or leather insert and beveled edges. The open base includes X-legs with a trestle connection. The open shelf at the base provides a spot for books and decor. Made to order in your choice of wood type and finish, this rectangular end table is shown in sap cherry with saddle stain. Shown in Sap Cherry with Saddle stain.